House Hildebrand, recently completed on a 1 521m² site bordering the Table Mountain reserve in Higgovale, Cape Town, is a captivating mix of contrasts. The strong architectural language, underscored by curves and angles in timber, glass and Rheinzink zinc alloy, is tempered by the use of perennial grass on the roof. The architect, Paolo Deliperi, says that, although it is not a shy building, it manages to form a gentle relationship with the natural environment that surrounds it. The fynbos in the Table Mountain reserve to the south is introduced in the form of a roof garden on the structure and continues to cascade over an artificial hill, created by clean rubble from the demolition of the original house, to the north of the building. “Like volcanic lava, the mountain vegetation seems to engulf the building. 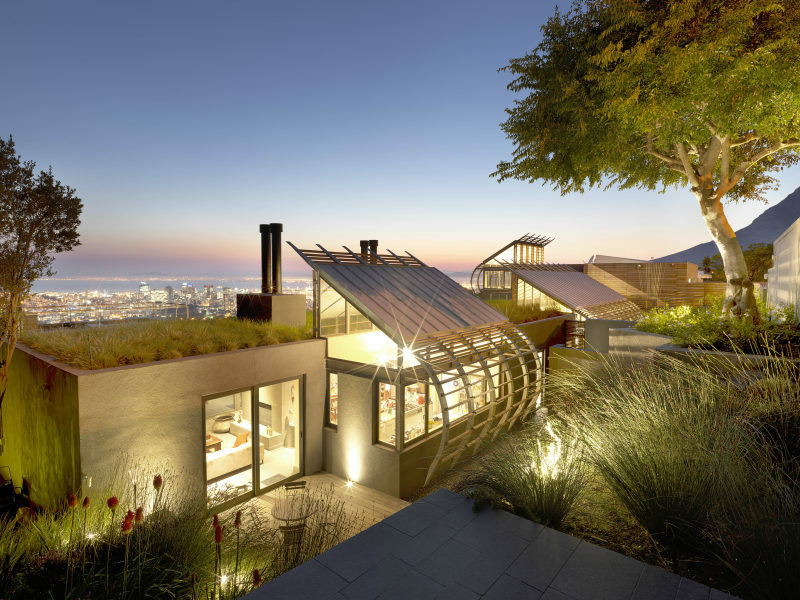 The perennial grass on the roof, chosen also for its low water needs, not only insulates the interior but, with its soft tufts moving in the breeze, contrasts effectively with the strong architectural language,” he says. 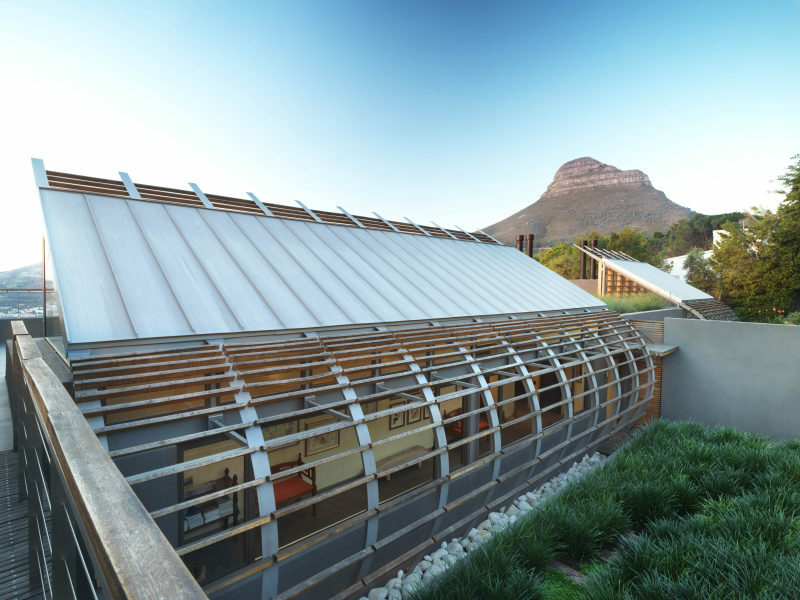 The fynbos in the Table Mountain reserve to the south is introduced in the form of a roof garden on the structure. The green of the grass is just one of the simple colours chosen. Along with the warm hues of timber and the grey of the Rheinzink zinc alloy for parts of the roofing and white and grey walls, it leaves a visually light impression. The colour spectrum can expect an addition in time in the form of an aesthetic patina created by natural weathering on the Rheinzink, which will protect the material for generations. The choice of Rheinzink also echoes the focus on energy efficiency in the design of the house, where interior spaces are never deeper than a single room where possible and designed to encourage natural cross ventilation and favourable natural light. Steel, timber and glass “light periscopes” introduce north light in the kitchen and art gallery, which are situated deeper in the footprint of the building. As an innovative contemporary building material known for quality, durability and lasting value, Rheinzink requires little energy in production and is 100% recyclable, meeting today’s essential design considerations for sustainability and low energy use. Caption main image: Steel, timber and glass “light periscopes” introduce north daylight in the kitchen and art gallery.